Physicists have spotted four new instances of black holes colliding and sending their gravitational waves toward the Earth, including the most massive collision recorded to date. We now know that black holes collide with some regularity throughout the universe. Individual collisions are no longer huge news stories—instead, astronomy has entered an era of in which gravitational waves are simply another tool to understand the universe, and new advances come from observing many gravitational wave events. The LIGO (Laser Interferometer Gravitational Wave Observatory) and Virgo collaborations have begun cataloguing these events to tell the broader story about how often these massive crashes occur and what causes them. A quick recap: The theory of general relativity predicts that certain events in the universe can turn mass into energy and emit gravitational waves, or ripples in the very shape of spacetime that travel at the speed of light. Two of LIGO’s mile-plus-long detectors in America, one in Washington State and one in Louisiana, and the Virgo detector in Italy hunt for this signal with interferometers. Essentially, they split and recombine laser light, which shines onto a detector. The passing gravitational wave causes the two laser beams to go in and out of phase with each another. The signal causes a wobble smaller than a proton’s width. You can read about what happens to the colliding black holes more generally in the article linked below, but in short, they combine into a bigger black hole and release excess mass as energy that travels as gravitational waves. 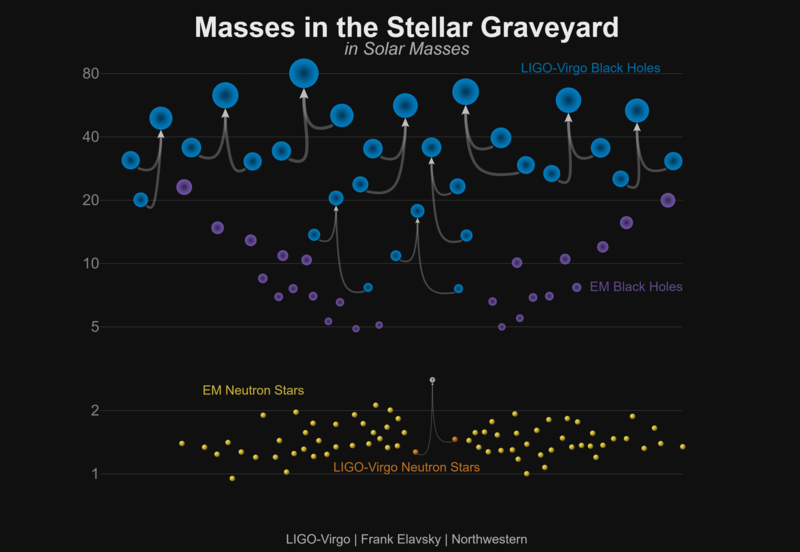 The researchers sifted through the LIGO and Virgo data for events and spotted four new ones that occurred during the summer of 2017. These collisions resulted in black holes weighing as little as 17.8 times and as much as 80.3 times the mass of the Sun, occurring at a distance between 1.044 billion and 8.97 billion light-years away. This brings the total number of known events to 10 measurements of colliding black holes and one measurement of colliding neutron stars. The scientists estimate that each year, another 53 black hole mergers occur in every cubic gigaparsec (that’s a box 3.2 billion light-years on a side) of the universe. They published the results in a pair of papers over the weekend. Physicists used three independent analyses to find the events in the data, according to a press release. Additionally, there were 14 other potential collisions that only appeared in two of the three analyses. One of the collisions, the one that resulted in a black hole 80.3 times the Sun’s mass, was especially interesting. Scientists don’t think stars collapsing can result in black holes heavier than 45 solar masses, explained Imre Bartos, University of Florida assistant professor. Plus, it appeared to spin quickly. Perhaps this anomalous observation came from two black holes that merged, and then later merged with a third black hole, in a black hole-rich environment. Such environments even seem to exist near the centre of our own galaxy. More observations of gravitational waves will help researchers determine what kinds of environments these collisions occur in, and how black holes get so close together in the first place. But there’s more to be enthused about. They might let scientists hunt for theorised new particles, like axions. And black hole collisions aren’t the only things that produce gravitational waves; colliding neutron stars do, too. Though scientists didn’t find any new neutron star collisions yet, having a large catalogue of neutron star collisions will allow them a new way to determine how quickly the universe is expanding.